The World Coal Association ignores innovations to reduce electricity prices, raise efficiency and reduce emissions. Technology now available allows reliable electricity to be generated with just one-third of the coal burned in "High Efficiency, Low Emission" (HELE) coal-fired power plants. The World Coal Association had called for investment in development of technology for cleaner coal in 2015. Now that technology is available, the World Coal Association has slammed a moratorium on its use. The natural gas industry also opposes innovations to reduce energy bills and avoid the need for ever more costly drilling and fracking. Ever done a financial analysis on producing methane from hydrogen and carbon? Carbon from many different substances can be combined with hydrogen to produce methane. When methane is used to fuel an Ultrahigh Temperature Gas Turbine Combined Cycle power station, carbon dioxide emissions are 310 grams per kilowatt-hour. The amount of carbon needed for each kilowatt-hour from any power station can be calculated if the carbon dioxide intensity is known. Each 44 grams of carbon dioxide contain 12 grams of carbon. The other 32 grams are oxygen. 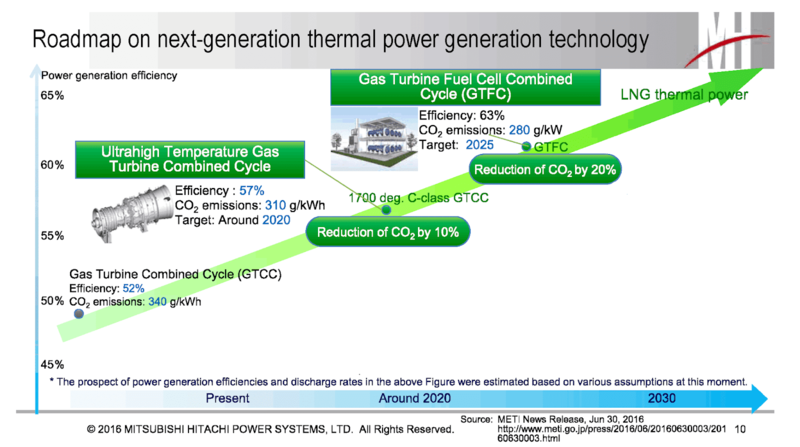 The Ultrahigh Temperature Gas Turbine Combined Cycle power station needs methane made with 310 x (12 / 44) grams of carbon for each kilowatt-hour of electricity. That is 85 grams of carbon for each kilowatt-hour. Some other power station technologies need a lot more carbon for each kilowatt-hour of electricity generated. When coal is used to fuel a high-efficiency low-emission "HELE" ultra-supercritical coal-fired power station, carbon dioxide emissions are 900 grams per kilowatt-hour. The amount of carbon in the coal needed for each kilowatt-hour of electricity generated is 900 x (12 / 44) grams. That is 245 grams of carbon for each kilowatt-hour. Some other common materials contain carbon that can be used to produce methane. Each 28 grams of waste polyethylene plastic (C2H4)n contain 24 grams of carbon and 4 grams of hydrogen. Each kilogram of wheat straw with about 7% moisture content is made of 48% cellulose by weight (of which carbon is 44%) and 25% is lignin by weight (of which carbon is 65%) ... (((1000 x (48 / 100) x (44 / 100)) + (1000 x (25 / 100) x (65 / 100))). That is 374 grams of carbon in each kilogram. Choosing whether to burn 245 grams of carbon in coal or just 85 grams of carbon in methane to produce each kilowatt-hour of electricity seems to have only one obvious answer. The World Coal Association simply refuses to answer this question. Representatives of the gas industry also refuse to answer this question. So-called "intermittent" renewable energy can be used in two or more ways to make synthetic methane from any material (straw, waste plastic, coal, etc) containing carbon. One way is to use renewable energy when supply exceeds demand to power a plasma gasifier. Another way is to use renewable energy to produce hydrogen by electrolysis of water - and combine that hydrogen with carbon from one or more sources. As well as industry refusing to answer simple questions about innovation, the Australian Government tries to sell gas exploration rights to the gas industry even though this old method of obtaining natural gas - which is mostly methane - is no longer needed. The Western Australian Government is also reviewing this obsolete method of obtaining methane in considering whether to sell "fracking" rights over large swathes of Western Australia. Small-scale biomass gasifiers are one more renewable energy generation option for Australian farms that need affordable, reliable 24 hour a day electricity supplies. For example, a seller on Alibaba in China has a biomass gasifier offered for $500 - $1,000 per unit.